When I compounded my current line of perfumes, I knew nothing of the Odor Effects Diagram. I went by smell alone. 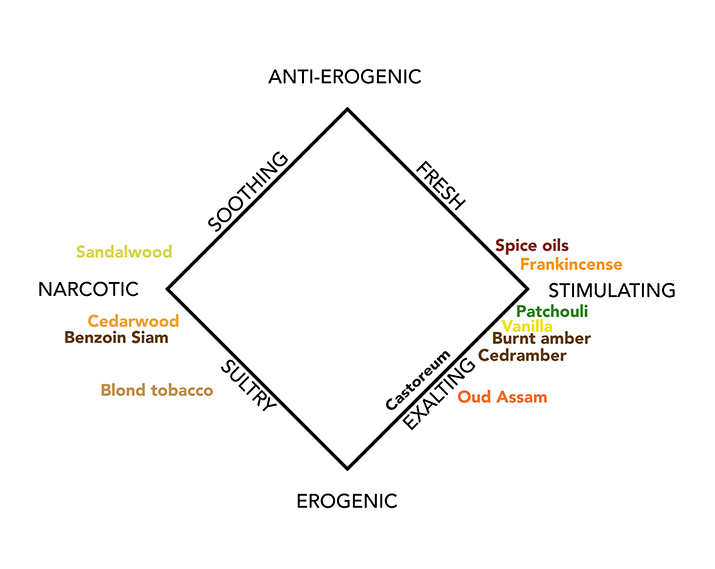 Curious to arrange my own perfumes on the diagram, I first chose Amber as I know it has enjoyed recent complimentary interest within the online community. The perfume demonstrates nothing purely anti-erogenic and, in fact, there are no head notes per se—the whole thing just comes out and grabs you. As you continue to smell it, though, further complexity emerges. Some of the stimulating materials share an exalting or a fresh character. Spice oils can go either way. Here, the spices lean toward the anti-erogenic. Frankincense, while clearly stimulating, also shares an anti-erogenic, lemony top note. The perfume contains plenty of exalting materials—those that both stimulate and exhibit a bit of funk. Oud is the most erogenic and, along with castoreum, provides the necessary animal and dissonant sexiness. Sultry ingredients are both erogenic and narcotic. Blond tobacco is sweet, but has complex animal tonalities that push it toward the erogenic. Dark tobacco, the kind used in French cigarettes, is both stimulating and erogenic, hence exalting. Atlas cedar is a narcotic ingredient with a little funk pulling it in a sultry direction. Benzoin Siam, being balsamic, is also decidedly narcotic. I don’t know where Jellinek places sandalwood, but my guess is that it’s soothing. It has elements of the narcotic—a sweet gentleness—and yet has an anti-erogenic freshness. Sandalwood, spices, and frankincense all demonstrate anti-erogenic effects. The chart leaves me wondering if Amber might have benefited from an anti-erogenic ingredient such as something citrus. I’ll experiment, but I will not change the formula.